The Aphasia Association have lots happening around NZ including regular support groups in Auckland and Christchurch. See our 'Upcoming events and lectures' calendar for dates. They are also currently investigating what iPad apps may help people with communication both in the community and at home with family and friends. Stay tuned...! 3 How is aphasia diagnosed? 4 What research is being done for aphasia? Aphasia is a disorder that results from damage to portions of the brain that are responsible for language. For most people, these are areas on the left side (hemisphere) of the brain. Aphasia usually occurs suddenly, often as the result of a stroke or head injury, but it may also develop slowly, as in the case of a brain tumor, an infection, or dementia. The disorder impairs the expression and understanding of language as well as reading and writing. Aphasia may co-occur with speech disorders such as dysarthria or apraxia of speech, which also result from brain damage. There are two broad categories of aphasia: fluent and non-fluent. 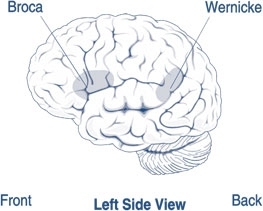 Damage to the temporal lobe (the side portion) of the brain may result in a fluent aphasia called Wernicke’s aphasia (see figure). In most people, the damage occurs in the left temporal lobe, although it can result from damage to the right lobe as well. People with Wernicke’s aphasia may speak in long sentences that have no meaning, add unnecessary words, and even create made-up words. For example, someone with Wernicke’s aphasia may say, “You know that smoodle pinkered and that I want to get him round and take care of him like you want before.” As a result, it is often difficult to follow what the person is trying to say. People with Wernicke’s aphasia usually have great difficulty understanding speech, and they are often unaware of their mistakes. These individuals usually have no body weakness because their brain injury is not near the parts of the brain that control movement. A type of non-fluent aphasia is Broca’s aphasia. People with Broca’s aphasia have damage to the frontal lobe of the brain. They frequently speak in short phrases that make sense but are produced with great effort. They often omit small words such as “is,” “and,” and “the.” For example, a person with Broca’s aphasia may say, “Walk dog,” meaning, “I will take the dog for a walk,” or “book book two table,” for “There are two books on the table.” People with Broca’s aphasia typically understand the speech of others fairly well. Because of this, they are often aware of their difficulties and can become easily frustrated. People with Broca’s aphasia often have right-sided weakness or paralysis of the arm and leg because the frontal lobe is also important for motor movements. There are other types of aphasia, each of which results from damage to different language areas in the brain. Some people may have difficulty repeating words and sentences even though they can speak and they understand the meaning of the word or sentence. Others may have difficulty naming objects even though they know what the object is and what it may be used for. Anyone can acquire aphasia, including children, but most people who have aphasia are middle-aged or older. Men and women are equally affected. There are approximately 16,000 people in NZ with aphasia, the majority acquiring aphasia after stroke: the rest from head injuries and diseases to the brain. Approximately 75% of people with aphasia in NZ are of retirement age. Around 6 people acquire aphasia every day in NZ. Aphasia is caused by damage to one or more of the language areas of the brain. Many times, the cause of the brain injury is a stroke. A stroke occurs when blood is unable to reach a part of the brain. Brain cells die when they do not receive their normal supply of blood, which carries oxygen and important nutrients. Other causes of brain injury are severe blows to the head, brain tumors, brain infections, and other conditions that affect the brain. Aphasia is usually first recognized by the physician who treats the person for his or her brain injury.Frequently this is a neurologist. The physician typically performs tests that require the person to follow commands, answer questions, name objects, and carry on a conversation. If the physician suspects aphasia, the patient is often referred to a speech-language pathologist, who performs a comprehensive examination of the person’s communication abilities. The examination includes the person’s ability to speak, express ideas, converse socially, understand language, read, and write, as well as the ability to swallow and to use alternative and augmentative communication. For most cases, however, language recovery is not as quick or as complete. While many people with aphasia experience partial spontaneous recovery, in which some language abilities return a few days to a month after the brain injury, some amount of aphasia typically remains. In these instances, speech-language therapy is often helpful. Recovery usually continues over a two-year period. Many health professionals believe that the most effective treatment begins early in the recovery process. Some of the factors that influence the amount of improvement include the cause of the brain damage, the area of the brain that was damaged, the extent of the brain injury, and the age and health of the individual. Additional factors include motivation, handedness, and educational level. Aphasia therapy aims to improve a person’s ability to communicate by helping him or her to use remaining language abilities, restore language abilities as much as possible, compensate for language problems, and learn other methods of communicating. Individual therapy focuses on the specific needs of the person, while group therapy offers the opportunity to use new communication skills in a small-group setting. Stroke clubs, regional support groups formed by people who have had a stroke, are available in most major cities. These clubs also offer the opportunity for people with aphasia to try new communication skills. In addition, stroke clubs can help a person and his or her family adjust to the life changes that accompany stroke and aphasia. Family involvement is often a crucial component of aphasia treatment so that family members can learn the best way to communicate with their loved one. Help the person become involved outside the home. Seek out support groups such as stroke clubs. Scientists are attempting to reveal the underlying problems that cause certain symptoms of aphasia. The goal is to understand how injury to a particular part of the brain impairs a person’s ability to convey and understand language. The results could be useful in treating various types of aphasia, since the treatment may change depending upon the cause of the language problem. An online aphasia therapy program. The Aphasia Network is a 501(c)(3) non-profit organization supporting an underserved population of persons with aphasia. Aphasia -an acquired communication disorder caused by brain injury or stroke- impairs comprehension and production of spoken language, but does not affect intelligence. Because communication is essential to relationships and performing daily tasks, persons with aphasia and their families can experience emotional, physical and financial stress and social isolation. Our goals are to raise awareness and help survivors rebuild communication-associated life systems impacted by aphasia: Quality of life, Daily life skills, Community and Support. For more information on what services are available to you please see our "Things you should know about"